A miscreant who found and tortured an armadillo, and then posted a video on social media of the despicable act now faces serious time behind bars thanks to the investigative efforts of a pair of Texas game wardens. A few months ago after learning of the incident, game wardens made a criminal animal cruelty case by securing videos and other evidence, statements and an arrest warrant that landed the young man in jail. The defendant’s plea deal on two separate charges, including burglary of a habitation and the animal cruelty case, resulted in a six-year sentence on both charges to be served concurrently in state prison. A Houston County game warden recently received a call concerning possible illegal hunting activity in the Germany community outside of Crockett. The warden proceeded to the house in question, and as he pulled into the yard, a female made a beeline to the front door of the house and closed the door behind her. In the front yard was an ice chest with a sizable six-point buck’s head on it. The warden knocked on the door and asked the female to come back outside, but got no response. He then walked around the house and discovered another deer head and a Liberty County jail offender ID card nearby with the female’s photo on it. A criminal database search found her to have two active felony arrest warrants. The warden, with help from a local sheriff’s deputy, searched the immediate area near the home but was unable to locate the suspect. Texas Department of Criminal Justice tracking dogs was called in to assist, and after a couple hours, the dogs followed a scent trail back to the original house where the warden found the woman hiding underneath a pile of dirty laundry wedged between a washer and dryer. By this time the hunters who were the focus of the initial visit had returned and received citations for no hunting license and numerous warnings. The female suspect was booked on the outstanding warrants. Just after midnight on New Year’s morning, a Montgomery County game warden along with a ride-along was patrolling on Highway 59, when they entered a dense fog mixed with fireworks smoke. The warden noticed multiple vehicles were involved in a pileup and activated his emergency lights. Both the game warden and his observer provided essential medical attention and moved all the vehicles’ occupants to safety. However, more vehicles continued to slam into the mound of crashed cars. As the warden was providing updates to dispatch, another vehicle came crashing into the scene. He was able to toss his mic into the truck, slam the door, and jump out of the way as the SUV that had already hit several other vehicles came skidding by the driver’s side of his patrol unit. In total, more than 20 vehicles were involved in the accident before emergency personnel was able to stop traffic ahead of the fog bank. 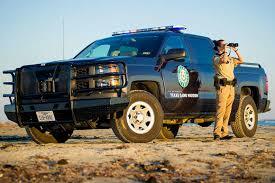 The game warden’s truck was the only vehicle on the scene that remained undamaged. What appeared at first glance to be a few paperwork errors ended up being a significant attempt to circumvent Texas deer regulations by a group of out-of-state hunters. While inspecting a New Braunfels taxidermy business, game wardens noted several entries in the resource log containing conflicting information. The business owner assisted in identifying the individual hunters and helped locate the like antlers on hand. Three of the out-of-state hunters used Special Non-Resident Five-Day licenses, which are not valid for hunting white-tailed deer. A fourth non-resident hunter harvested a deer on Oct. 18, 2018, and posted images and video on social media a couple days later, but records showed he did not purchase a hunting license until Oct. 22. Subsequently, the four sets of antlers corresponding with these hunters were seized, and citations for hunting white-tailed deer without valid general non-resident hunting licenses were issued. Wardens then interviewed the landowner where these four deer had been harvested and during an inspection of the property’s deer harvest log found the landowner had claimed the buck killed by the unlicensed hunter and used his hunting license information instead. The landowner was cited for allowing a person to hunt under his license. Wardens then checked the hunting license status of all the hunters listed on the landowner’s harvest log and found another out-of-state hunter who had harvested a deer on this property also used a Special Non-Resident Five-Day license. A warden from that hunter’s home state was contacted and asked for assistance in locating this subject. The out of state warden made contact with the hunter and was able to determine that the individual had taken two white-tailed deer in Texas illegally. The warden seized the antlers from these two deer and returned them to the Texas wardens. Two additional citations for hunting white-tailed deer without valid general non-resident hunting licenses were issued. Cases and civil restitution now pending. On the night of Dec. 28, 2018, San Augustine County game wardens deployed a white-tailed deer decoy set up to catch would be road hunters near the Banister Wildlife Management Area and the Angelina National Forrest. At about 10:45 p.m. the wardens observed a pickup truck drive past the decoy and come to a stop. They turned around and returned at a slow rate of speed. As the pickup approached the bait, one of the wardens observed a red beam of light that appeared to be a laser. The truck pulled alongside the decoy and fired a shot. A warden approached the vehicle, and before he could finish announcing himself, the road hunters fired a second shot at the lure. Charges were filed for various hunting-related violations at the San Augustine County Jail. As one non-resident deer hunter learned the expensive way, purchasing a hunting license after you take to the field is not an option. He was about to enter his trophy-sized Texas white-tailed buck in a prestigious big deer contest when this individual got pulled over by a local police officer in Freer for a traffic violation. A game warden happened to be on hand and saw the big buck in the bed of the man’s truck. The warden noticed the man was acting nervous about his presence and made contact for a routine compliance check. The warden verified the subject had a valid non-resident hunting license, purchased at 6:15 p.m. on Dec. 28, 2018, and had tagged his kill correctly. The warden reached out to his colleague in Live Oak County where the trophy was taken, and a subsequent call to the manager of the ranch the hunter noted on his license harvest log. The ranch manager validated the hunter’s account and texted the warden a photo of the kill, which showed the deer deceased at 5:00 p.m. based on the digital time stamp, indicating the hunter bought his license after the fact. When asked about the timeline discrepancy the hunter stated that he had applied for a hunting license before going hunting, but it hadn’t been approved until that evening. The warden informed the hunter that there is not a vetting/application process for a hunting license in Texas and that it is valid upon purchase. Cases were filed, and restitution is pending. The deer was scored at 187 2/8 on the Boone & Crocket scoring system. During a compliance check at a meat processing facility in Refugio County, a game warden noticed a couple of deer harvested by a woman was brought in within a few days of each other. An employee stated the deer was actually brought in by a man claiming to be the hunter’s son. The workers never saw the woman whose tags were on the deer. The warden made contact with the hunter, and when asked what she shot, the woman stated she had shot a buck and a doe with a 30-06 caliber rifle. When the warden asked to see her hunting license, the woman reported her license was at her son’s residence. Contact was then made via telephone with the son later that day. The son said that his mom had shot two bucks with a .270 caliber rifle. Wardens met with the son at his residence, and after some more contradicting statements, the truth finally came out. He admitted to shooting two bucks using his mother’s license tags. In addition to hunting under the license of another, it was discovered that he had shot a total of four bucks. Cases are pending for hunting under the license of another, over the bag limit of white-tailed deer buck, and no harvest log. Civil restitution was also filed. While patrolling Matagorda for recreational fishing compliance, game wardens came across two men fishing. When asked if they had caught anything, one man stated, “Yes, but I threw them back because they were too small.” After being asked a few more times about having any fish, the gentleman finally said, “Yes, the ones I kept are in that bucket.” After inspecting the contents of the bucket, three undersized red drums, one undersized sheepshead, and one undersized black drum were recovered. Citations and civil restitution pending. The fish were donated to a local family in need.